As the year closes out, my hospital’s employed physician group continues to acquire physician practices under the guise of building its accountable care network. At this stage in the game, however, the strong independent practices have either grown to a point where acquisition isn’t a viable option or have banded together as part of IPA groups and aren’t interested in being employed. For the rest, however, it seems there’s no practice too questionable for us to purchase. I was out of the office last month when the operations leaders did due diligence on a small pediatric practice. I had heard that there were some “interesting” things noted on the site visit, but leadership was bent on purchasing it anyway. The physician is close to retirement and they figure they can just plug a new physician (straight out of residency) in July and absorb the patient volume as the owner steps away into the sunset. In the mean time, my team’s job is to get the EHR live, transform care delivery to bring them up to MU-ready standards, and deal with all the fallout. I went to the office on Friday for an initial workflow review. One of the implementation team members is fairly new, and although skilled with EHR, has never converted a practice from paper. The team lead who was supposed to be running this one ended up having her first grandbaby arrive, so I stepped in to cover the day of shadowing. We have a checklist of things to review and we also shadow office staff as they go through their daily activities. Ultimately we’ll create current state workflow maps and use those to derive a future state. We’ll take that back out to the practice and validate it with the physician and office manager, put together a Team Operating Agreement, and then schedule them for implementation. Often there is a fair amount of clean-up that has to be done with the workflows and addressing that is within the purview of our implementation team. Our operations staff initially fought us on this, but finally conceded that practice roles and responsibilities, patient flow, and EHR workflow are so intertwined that they can’t be addressed separately (especially if you’re trying to bring practices live on a rapid cycle). They also didn’t have the resources to adequately handle process improvement, so it was an easy “poach” when I decided it needed to live on my team. My initial impression from the waiting room was a good one – freshly remodeled, new furniture, adequate space, and a cool salt water fish tank that the patients were enjoying. The receptionists were friendly and using computers proficiently. The exam rooms were large, with plenty of space to add a computer workstation and not lose the room needed to park strollers and the extra family members who often come to visits with new babies. I liked the way the layout clearly separated the “on stage” patient care areas from the “off stage” staff work areas, which not only helps control clutter, but reduces risk of patients overhearing phone conversations. Once I stepped into the staff area, a veritable house of horrors awaited me. I wasn’t sure whether they over-spent on the furnishings and remodel and tried to make it up by skimping on the rest of the office or whether they just didn’t care. The back half of the office was just dirty. 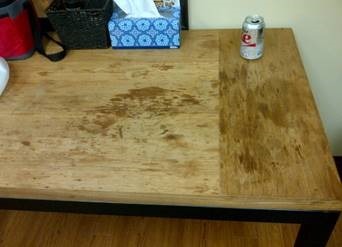 From the stained butcher block table in the staff lunch room to the piles of trash bags by the back door, I couldn’t believe what I was seeing. They knew we were coming, and if this is how they present the office for an assessment, I couldn’t imagine what it would look like if we showed up unannounced. 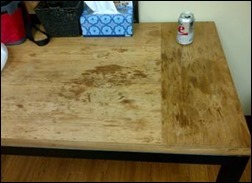 The counters and workspaces were crowded, with open drinks and snacks in the lab area, food crumbs in the keyboard of the computer they use to access the state immunization registry, and trash on the floor. Really, trash on the floor. Not the “oops, I dropped the cap to that needle while I was drawing up that injection” kind of trash, but the “I just don’t care and can’t be bothered to walk to the can because it’s on the other side of the room” kind of piles. The cabinets and walls were covered with so many “don’t forget to do this” or “X insurance requires that” notes and stickies that you couldn’t even see the walls. More than two-thirds of them were obscured and some of them had been there for years based on the dates. We started the assessment and quickly determined that no staff member had been there more than a year. Most had been there less than six months and two were new that week. That’s a red flag, as was the presence of the owner’s son as office manager. In the positive column, we knew all the clinical staff would be at least minimally tech savvy because they were using their smart phones constantly, even when work piled up and patients were waiting. We went through our usual questions about training and on-boarding, how work is divided, patient flow, and so on. I also asked about the remodel of the front half of the office (14 months ago) and how long the son had been managing the practice (18 months). The timing of the son’s arrival and its association with staff tenure was suspicious, as was the timing of the remodel. Pediatric practices are not exactly centers of profit, especially small solo ones. They’re a labor of love for most physicians, and if not run right, can be more chaotic than other specialties. I wasn’t sure whether the son had been brought in to try to remediate a problem or whether he was the cause. Unfortunately, the latter was confirmed when we had a chance to sit down with the physician later in the day. I haven’t heard such a sad story in a long time. The owner’s son had gone to college with the goal of being pre-med and eventually taking over the practice. His grades weren’t good enough to get into med school, so Dad financed an MBA at a for-profit university and hired him to manage the office instead. With no understanding of medical practice management or the realities of office cash flow, he embarked on an aggressive campaign to improve the office’s appearance. Driving them further into debt, he terminated the seasoned staff because they were costly and he assumed they were replaceable. The office spun further and further out of control and for love of family the owner didn’t want to reach out to a consultant or anyone else who could help. Ultimately, they felt they needed to sell to remain viable. He saw the purchase by the medical group as a way to continue doing what he loves and apparently wasn’t aware of the plan to add a physician to the practice in six months. Having been in this business as long as I have, none of this should be surprising. Still, every time I hear one of these stories, it shocks my sensibilities. First, that there are physicians in this day and age of regulatory complexity that still think a practice can be family run without specific training and administrative support by someone who actually knows what they are doing. Second, that the son was still in the practice even though we had acquired it. Usually we have a pretty good track record of buying out those kinds of situations when we take over. And third, that my own employer actually thought acquiring this practice was a good idea. Looking at reimbursement rates for general pediatrics, we won’t break even for a decade. It may be the right thing for the community, though, and I hope they acknowledge this and react accordingly when the negative financial statements start documenting what our guts already know. In the past, they haven’t been sensitive to the realities of acquiring damaged goods. Their knee-jerk reaction will likely be to push the physician out, replace him with a younger model, close the office proper, and move the “practice” (aka patient base) to an on-campus office. In the midst of all this chaos, we’re supposed to deploy EHR and have happy satisfied end users without expending more resources than are budgeted. Good thing the OSHA, CLIA, HR, and regulatory remediation won’t come out of my budget. We’re going to do our best with this practice. Although I’m not terribly hopeful, we’re in it to win it. As for our operational leadership, however, I’d like to throttle them. Does your employer make business decisions that leave you shaking your head? Email me. Wow. These stories still amaze me. I have being selling EHR for over 13 years, so I have personally visited hundreds of medical practices. I have seen examples of this practice more than I care to mention. The complexity of running a medical practice takes a team of people or one very driven doctor that can see 20 patients a day five days a week and run the business. One of the biggest mistakes I see is practices not seeing value. What is the value of a good biller, the value of front office staff, and medical assistants. Ultimately, the doctor is responsible as he is the business owner and has the experience that was not thought in a MBA program.